At Wilkins RV we strive to make your web browsing experience enjoyable. That means our site is designed to provide you with an optimal experience on every device. So, whether you’re browsing on your phone, tablet or desktop, you can rest confident that our site will meet your needs. One of the newest features on our site is the favorites feature. It allows you to add favorite (select the little heart icon below the RV you’re looking at) RVs you are interested in and then view all your favorite RVs on one page. 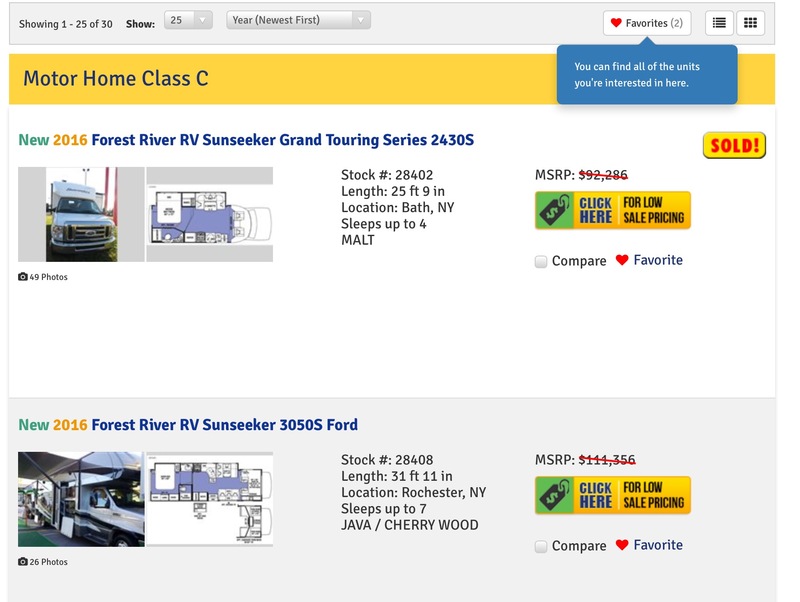 This feature allows you to easily view the RVs that you think might best meet your needs all at the click of a button. And, once you’re ready to get more information about these RVs, you can fill out the convenient form on the favorites page. This form is securely delivered to our experienced team, who will then evaluate your needs and help you. While we’re here to help you during your RV search, we are also here to support you before and after the sale. We offer free RV workshops and an experienced RV service team who can offer quality service at an affordable price. So, what are your waiting for? Hop online and start browsing our new and used RVs for sale, then contact us for help!